Product prices and availability are accurate as of 2019-04-10 20:25:39 EDT and are subject to change. Any price and availability information displayed on http://www.amazon.com/ at the time of purchase will apply to the purchase of this product. Get to your favorite Web sites quickly, download graphics with unbelievable ease, and enjoy real-time interactive PC gaming and expand console gaming with broadband Internet access from the cable modem market leader-Motorola. With the next-generation SURFboard SB5101 cable modem, you're compatible with today's broadband Internet-and ready for the future, too. When your cable service provider upgrades to a DOCSIS 2.0 network system, you'll surf the Internet at as much as 30 Mbps-3 times faster than earlier modems! With Ethernet and USB connectivity, installation couldn't be simpler. A convenient stand-by button provides hassle-free security by disengaging from the PC without disconnecting from the cable network. Troubleshooting is a breeze too, thanks to front panel status indicator LEDs and an online diagnostics page.Once you've experienced broadband powered by Motorola, you'll never want to go back to dial up again! 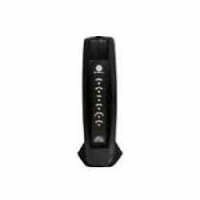 Get onto the cable pipeline today with the powerful, convenient, flexible and simple to install SURFboard SB5101 cable modem.